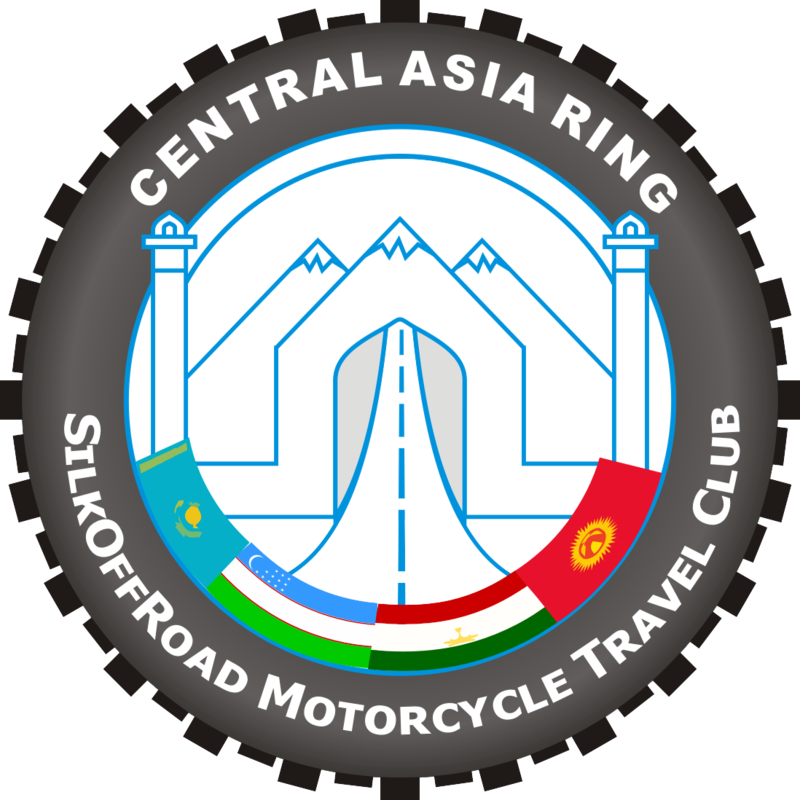 Central Asian Ring is exclusive adventure motorcycle tour around Central Asia. This motorcycling tour is a real dream for any traveler! One tour includes four different countries, which every single of them has its own culture and inimitable nature! You are going to visit: Samarkand – ancient city standing right on the Great Silk Road in Uzbekistan with its fantastic architecture and eastern bazaars. You will go trough breathtaking mountain passes of Tajikistan and climb on legendary highway Pamir passage of 5000 meters above sea level altitude and Wakhan valley on Afghanistan border . In Kyrgyzstan you will enjoy diverse nature of Tien-Shan Mountains with its gorgeous views and of course you will stay at amazing resorts of Issyk-Kul Lake. You won’t be able to miss Kazakhstan with its endless steppe and fantastic Charyn Сanyon. You are the one who is going to experience this beautiful journey on a motorbike! P.S. We do not describe some places and roads on our website because it is exclusive part of our itinerary and commercial secret. Arriving to Almaty. Airport transfer to hotel. Meeting at noon for lunch in a restaurant of national food. City tour: we will visit Medeo mountain gorge with the highest sport complex in the world and a unique mud dam. Then we make trip by bus way up to the Kok-Tobe mountain, where you can enjoy panoramic view of Zailyiskiy Alatau along with the city of Almaty itself. Back to hotel. Rest. We meet again to get briefed and check the motorbikes.Next in the plan before the dinner we will visit the important sightseeing spot of Almaty – Park of 28 Panfilovs and a beautiful Cathedral. Evening dinner. Overnight in hotel. Early wake up. Breakfast at the hotel. And off we go. Today we will have to cover on motorcycles the biggest distance of the tour – 500 kilometers. You shouldn’t be surprised since we are going through Kazakhstan – the biggest country in Central Asia and 9 place in the world by territory, where these long intervals are nothing in a scale of its infinity. You will ride on new highway "Western China – Western Europe” which was build on place original road of Silk Way. Evening dinner. Overnight in hotel. 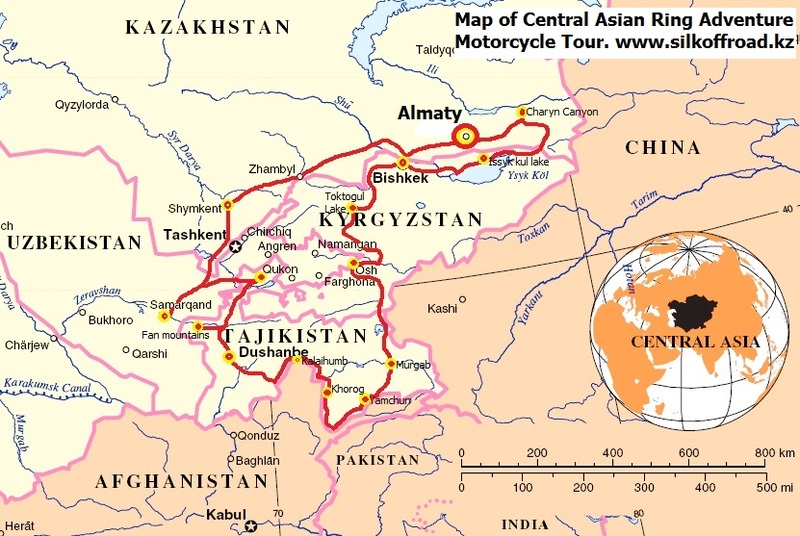 In the morning we will continue to ride motorcycles on Central Asia. Today we will leave Kazakhstan, cross the border and enter Uzbekistan – a country of flower fields, juicy tasty fruits and ancient cities of the Silk Road. We will stay in Tashkent - capital of Uzbekistan. Today we will reach Samarkand city, which is one of the oldest cities in the world. Over two thousand years ago Samarkand originated in the steppes of central Asia and became the main trading center of the Great Silk Road. Overnight in a cozy hotel that surrounded by ancient architectural monuments. Today our motorcycles rest, and we are immersed in the ancient city of Samarkand. Samarkand witnessed the time of Alexander Makedonsky, occupation of great Chingyz khan and Timur the Lame, possessing a mix of different cultures. Magical city! In 2001 year Samarkand was included in the World Cultural Heritage List of UNESCO. Our city tour will be divided in two parts and we will need no bikes for that. Before the lunch time you will visit: Gur-Amir mausoleum and Registan square and Bib-Khanum mosque. Real pilaf for lunch – national Uzbek meal, the crown jewel of Uzbekistan kitchen. The hottest time of the day we are going to spend in a hotel and then you can continue excursions visiting Samarkand bazaar. Overnight hotel. In the morning we will continue our motorbike tour .Today we are leaving Uzbekistan with its priceless heritage and are heading to the country of rivers and gigantic mountains – Tajikistan. Country with the weakest economy in Central Asia, but with the most friendly and hospitable people. We will pass on our motorcycles through new mountain tunnel of Shahriston Pass (3378m), which is the shortcut to the Fann Mountains. Some part of the route follows tough mountain roads. But those remote tiny Tajikistan villages definitely worth it. We are going to arrive to the international alpinist camp "Vertical – Alaudin”, pitch our tents there on a green field surrounded with snowy mountains. Overnight tent camp. In the morning we will make short trekking to Alauddin Lakes where enjoy gorgeous view over the Fann Mountains. Then we continue the journey! Going down the Fann Mountains we will get to the road, leading to Dushanbe through 5 km of Anzob tunnel, which was built inside Gissar Range in 1980 year. It's 5 kilometers of darkness and cold where will rattle your nerves!) We will reach Dushanbe - the capital of Tajikistan. We will visit the national museum to get acquainted with the culture and history of this people. Also we will visit square of city with the highest flag that entered the Guinness Book of Records as the highest flagpole in the world back in 2011. Overnight in hotel. We continue our motorcycle adventure and are heading to Gorno-Badakhshan Autonomous province (GBAO). Today we will get very close to Afghanistan and follow its border, where Panj river will separate us from Afghan villages where afgan people still live there the same way they used to hundred years ago. We will perform traditional washing ritual under Ali mountain waterfall, which is falling down the rock of 40 meters height. We are going to arrive to Kalaikhum kishlak by the end of the day, where cozy rooms of a guest house are already prepared for us. Overnight guesthouse. Today we will drive on legendary Pamir highway (M41) on our motorcycles , which was built in the 30-s during USSR times in order to develop Pamir area. It is one of the most unique mountain roads in the world that goes through such unassailable terrain. We will pass many Tajikistan kishlaks, where local people, especially local kids, will welcome you gladly with heartwarming handshakes and entertain you with different fruits. Overnight guesthouse. Day off for rest. During the day you can visit local bazaar. You can also buy jewelries at Khorog factory with local precious stones and visit Botanic Garden. The day will be finished with dinner and exclusive concert of local Pamir musicians with traditional instruments. Overnight. 11. Khorugh– Bibi Fatima hot springs(Yamchun). 180 km. We are still following on motorbikes the border with Afghanistan. Pamir's road keeps up abrupt coast of Panj river, separating us from Afghanistan. We will climb over Yamchun fort and reach 3 200 meters altitude. This day and place is needed for us to get acclimatization period before the Pamir's high mountains more than 4000 m.Here we are going to catch an amazing view of Afghanistan valley at Wakhan Valley and take a bath in the sacred waters of Bib Fatima hot spring. Overnight guesthouse. We climb the high Pamir plateau to reach kishlak Murghab – the heart of high-mountain Pamir where we will move within 4000 meters above sea level with Hargush (4 344 m) and Nazaitash (4137 m) mountain passes, as well as endless Alichur valley with fun yaks. By the end of the day we will reach Murghab - the highest kishlak on Pamir. Overnight hotel. 13. Murghab – Osh city 420 km. We will continue our motorbike tour on Pamir Highway! Be ready to go through the highest mountain pass in USSR and Central Asia – Ak Baital mountain pass, 4 655 meters high and Kyzyl -Art pass (4280м). From the side we will try to look at the famous Lenin Peak 7134m (depends on weather). We will say goodbye to Pamir and Tajikistan and go down to warm and bright country of Kyrgyzstan. Stopping at Osh city, which is situated in the middle of Fergana valley. Ancient Osh city used to stay on the Silk Road and it is the second most populated city in Kyrgyzstan after Bishkek capital city. Overnight tent. After tough Pamir, Kyrgyzstan will look likes paradise. Beautiful green mountains, gorgeous mountain passes with good roads. We will pass Fergana valley that provides fruits for all over Central Asia and taste it on our way through the valley. Our resort is situated on the Toktogul Lake , where we can swim for a while. For dinner, fresh trout from the lake. Overnight resort. 15. Toktogul Lake – Bishkek. 340 km. Our motorcycle tours passes through a colorful mountains of Tien Shan. Crossing Kyrgyz ridge through Alabel (3184m) and Too - Ashuu tunnel (3685m) passings. Passage through the Suusamyr mountain plateau where nomadic yurts and animals are scattered over hills and valleys. There we have tea break in yurt and have a short rest there. Arrival Bishkek – capital of Kyrgyzstan. Overnight hotel. 17. Bishkek - Issyk Kol Lake. 380 km. Today we will continue our adventure . After Baom Gorge we will stay on the coast of Issyk-kul - the "Pearl of Central Asia”. A unique mountain lake that is situated at the altitude of 1 609 meter above sea level, included in the list of 25 the biggest lakes in the entire world and take the 7th place in list of the deepest lakes. It is 702 meters deep. 100 of rivers fall into the lake, but there are no rivers flowing out of it. We will spend the whole day at the resort, enjoying beautiful water, taking sun bathes and just relaxing. We will leave beautiful Kyrgyzstan and cross the border to be back to wonderful Kazakhstan. We are going visit amazing Charyn canyon and climb down to the bottom of it, where we will spend a night in real yurt – traditional houses of nomads. The whole time we will be surrounded with fantastic flower and mystical rocks of ancient canyon. 19. Charyn Canyon– Almaty. 215 km. Our great journey on motorbikes is about to finish; full of unforgettable feelings we are going back to the most beautiful city of Central Asia – Almaty. We will celebrate our successful tour in the restaurant, where you will be given certificates and presents as keepsakes of the tour. And after, let the party begin! During this day you may take a rest in your hotel room after heavy party night or just have a walk around the city and buy some presents for your friends and family. After the lunchtime we will meet up and visit Arasan bathhouse, the biggest one in Central Asia. Enjoy hot sauna, relaxing massage and cold beer. Thus, all clean and rested, you are ready to come back home. We will organize transfer to Almaty airport according to your flight time. Have a save flight! Thank you very much for being with us during this tour! You are always welcome here to take part in another fascinating motorcycling tour around Central Asia! Here is contacts of travel agency which helped. Note. We do not receive any money commission from deals on a visa. It's not our business. So we are no responsible for their organisation. Just we share contacts with you. You can use other providers. Please, contact us first before applying for visa, since visa procedures differ according to the country of your citizenship. Citizens of some countries do not need visa to Central Asian countries or may obtain it according to simplified procedure. You may also obtain visas to Uzbekistan, Tajikistan and Kazakhstan in general consulates represented in Almaty. In this case you will have to arrive to Almaty 3 – 4 days prior to the tour and stay here during working days. If you want to obtain visas here in Almaty, in order to apply for Uzbekistan visa, you will need visa support, which can be provided by one of our partners. Visa support fee does not include processing fee. You don’t need visa support in order to obtain visas to Tajikistan and Kyrgyzstan. Approximate visa cost is $100 (express visa). Unfortunately, visa procedure is inimitable part of the tour, so please take some time in order to finish this process successfully, but we want to reassure you, that you will not face any troubles and obtain your visa in the shortest time. We recommend starting visa process 2-3 months prior to the tour. We are always there for you to help! The baggage of participants which will be in the car support is limited. The weight of your bags that you take the tour should not exceed 10 kg (without motorcycle gear). And that means you have to take only the essentials. 1. Passport, driving licence , money. - helmet with visor. It's better to have an integral, flip-up or touring style helmet, but do not MX or open-face type, because in the mountains you can feel freezing rain, snow, wind and dust, which may make your face vulnerable. - motorcycle boots. You can use different shoes - touring boots or motocross boots. The main thing that they would protect your feet and comfortable for switch gear. 4. Necessary medications if you need them. 13. Photo or video camera. 14. Own sleeping bag for one night tent camp in Funn Mountains. We provide tent and mattress. P.S. You can also bring a variety of inexpensive gifts for local children. Central Asia is the region with sharply continental climate. Day temperature during summer period is +25 to +40 degrees. After the sunset, temperature drops to +20 degrees, and to + 15 in the mountain areas. It is hard to predict weather conditions in mountain regions of Pamir and Kyrgyzstan. Sometimes it can be cold wind or rain and it might be snowing in Pamir. So you have to be ready for any weather conditions. Most of the roads of this tour are asphalt. But Pamir highway section as Kalaikhumb - Khorog -Yamchun - Murgab - Sary Tash are very tough. In places it is a twisted old asphalt, or simply a gravel comb. Due to harsh natural conditions, remoteness and lack of financing, these roads are not sealed and have never been repaired. The quality of sealed roads in the mountain area is also inconsistent, as there might be construction works going or the road may be washed out due to heavy rains. In this case we will change the route. Please, be ready for that. There are some very long distances as well as very short ones. In any case daily runs range from 7 to 9 hours So you have to be ready for early wake up and arrive late. We are trying to provide the most comfortable accommodation in our tours. But conditions and serviсe may vary from very good in Kazakhstan to very low in Tajikistan. For instance, in such areas as the Fann Mountains,Kalaikhum, Khorog, Yanchun, Murgab there might be no electricity or water supply. It is due to remoteness of these places. We will have a camp in the Fann Mountains and our company provides tents, mattresses. You should bring own sleeping bag. If you dont have let us know we provide. Dinner and breakfast we have in accomondation places. Lunch in roadside cafe. Central Asian's food is not very diverse. Usually it's meat and dough. But for you will be usfull to know names some of most common dishes that are offered in road cafes and hotels. Lagman - is made from meat (mainly lamb), vegetables and long noodles. Shurpa is soup. Typically, this is a beef or mutton broth with large chunks of carrots, onions, tomatoes and potatoes. Good dishes for lunch. Pilaf is rice, meat, carrots, onions. Manty is stuffing beef with onions wrapped in dough. Kebab or kuyrdak is fried or braised beef or lamb with onions. Borsch is Russian soup. Meat broth with pieces of meat and with the addition of beets, cabbage, potatoes. The most common problem of guests is an upset stomach. It comes from the local uncommon food. Acclimatization of food takes several days. Some people have 2-3 days. Others can not get rid of this this until the end of the tour. Unfortunately, we are powerless here. So take the necessary medications. But some tips may help you. - - if you want drink beer better drink beer before meals. Pamir Highway passes at an average height of 3000 m. We will have a place for acclimatization in Yamchun. Sometimes people feel very tired or have a headache. So take the necessary medications. Be patient. This can take from 3 to 5 hours. You should be prepared that your things can be checked by the customs officer very carefully. They can even check your mobile phones and laptops. So make sure that your phones do not contain pornographic or religiously extremist information. Aslo make sure that you dont have any drugs in your stuff. Do not bring medicines containing narcotic elements. People in Central Asia are very friendly and hospitable. But you should be aware of some rules of behavior. - take pictures of border posts, police, military people . - appear in underwear in hotels and guest houses. Especially if there are local women there. Concerning relationship between participants and organizing company during the tours we don’t support "I am the client, and you are an executive” or "the client is always right” attitude, since we believe that during the tour we are all one big team, where everyone respects, understands and helps each other. THE MAIN ATTRACTIONS OF THE CENTRAL ASIAN RING ADVENTURE MOTORCYCLE TOUR. The Medeu, (Kazakh: Медеу; Medeu) or Medeo (Russian: Медео) is an outdoor speed skating and bandy rink. It is located in a mountain valley (Medeu Valley, or the valley of Malaya Alma-Atinka River) on the south-eastern outskirts of Almaty, Kazakhstan. Medeu sits 1,691 metres above sea level, making it the highest skating rink in the world. It has 10.5 thousand square meters of ice and utilizes a sophisticated freezing and watering system to ensure the quality of the ice. The mountain valley was named in honor of Medeo, a wanderer who lived in the last century and established own aul in this picturesque. site. Construction of the stadium began in the fall of 1949, and the first competition took place at the stadium on 4 February 1951. Medeu switched to its current system of artificial ice in 1972 by a team of Soviet engineers. The Medeu Dam, built in the late 1960s, stands immediately south of the skating rink, protecting it – and the city of Almaty itself – from potentially devastating mud flows. Viewpoints on top of the dam provide great views of the stadium. The dam has 3 successive altitude levels. Special water reservoir allows holding about 6 million cubic meters of water. Stairs known to city inhabitants and tourists consisting of 842 steps leads to the dam. Contests on ascension along this unique stairs are regularly carried out. Medeu has seen many world records in all the speed skating distances from 1951 until the 1980s: 500 m, 1000 m, 1500 m, 3000 m, 5000 m, and the 10000 m. In 1972, the rink made a very successful transition from natural ice rink to artificial ice rink. The bandy team Dynamo Alma-Ata, won the Soviet Championships in 1977 and 1990 and the European Cup in 1978. After the collapse of the Soviet Union in 1991, the costs to uphold the arena as a top ice rink proved too expensive for the independent Republic of Kazakhstan. The last great championship event for a long time on this ice rink was held in 1988—the Men's World Speed Skating Championship—which was won by the American skater Eric Flaim. In the early years of the 2000s, Medeo's future status as a competition rink was uncertain. However, it was proposed as the speed skating venue both for Almaty's unsuccessful bid for the 2014 Winter Olympic Games and the successful one for the 2011 Asian Winter Games. In the end, bandy was the only sport here during the Games. Speed skating was held at Alau Ice Palace in Astana. Medeo was the main arena of the Bandy World Championship 2012. In the late 19th century the first bishops of the Turkistan eparchy discussed the need for a Russian Orthodox Church in Almaty. On September 26, 1903 the bishop of Turkestan and Tashkent, Paisii (Vinogradov) consecrated the foundation of the church. Construction lasted between 1904 and 1907. The belfry was erected on September 14, 1906. The cathedral survived the 1911 earthquake with minimal damage, even though it was built without any nails, which some bishops attributed to divine intervention. The inner structure of the cathedral was made in the artistic workshops of Moscow and Kiev. The iconostasis was painted by N. Khludov. After the Russian Revolution the cathedral was used to house the Central State Museum of the Kazakh Soviet Socialist Republic. From 1930 to 1940 it was used by important public organizations. The first radio transmitters in Almaty were situated in the cathedral's belfry. Restoration work on the cathedral began in 1973 and lasted until 1976. In May 1995 control of the cathedral was returned to the Russian Orthodox Church, and after additional restoration work it was reopened for religious services in 1997. Park of Heroes 28-Panfilovtsev, located in the heart of the city. The park is the memorial of glory, and eternal memory lane with fire. Memorial to the great courage and honor established in memory of those who defended our Motherland, its freedom, independence and honor of the WWII years, 8 May, 1975 on the eve of 30 anniversary of the victory of Soviet people in the Great Patriotic War. It consists of three songs that complement each other. The first part - high relief «Oath» (left side) - is dedicated to the young fighters for Soviet power in Kazakhstan. The central part of the triptych - «Podvig» - captured images of the heroes-Panfilovtsev, Russians, Kazakhs, Ukrainians, symbolizing the international nature of the heroic feat of Soviet people in November 1941 near Moscow the right track «Trubyaschie glory», which gives the entire memorial optimistic sound, the images represent hymn of triumphant life. Along the alleys of memory installed obelisks with the names of 28 fighters 1075 Regiment 316 Rifle Division, accepted the unequal battle with German tanks during the winter of 1941, during the battle for Moscow. The Monument of Independence is installed in the city of Almaty in the Republic Square, on BajseitovaStreet and Satpayev Street road crossing. The complex represents the complete work of art that synthesizes architecture, sculpture andtexts of sayings of outstanding scientists, figures of culture and state. The monument is installed on a semicircular stylobate the diameter of which is 28 metres and which is situated in the centre of a paved round platform with 46 metres in its diameter. "The exposition of the complex’s territory is stretched horizontally on 180 metres. The composition’s centre is a vertical plastic sculpture 28 metres in height, reminding relief kulpitases (historical kazakh statues)of Mangishlak. It is crowned with «Golden» Man (Altınadam) (6 metres in height) - the ruler who drives a winged ouncein the standing position and symbolizes the firm government on the Kazakh earth. This image is recreated on the basis of studying the concrete archeological finds in a barrow of Issyk near Almaty where a sovereign of saks(VIII-IV centuries BC) was buried in smart clothes with regalias and attributes of the supreme power. (Its style of clothing, gold ornaments on it are the masterpieces of world art, inspired by the products of the human genius. A US$ 2.125 billion loan for the Kazakhstan South-West Roads Project will help upgrade the trade route linking China to Russia and Western Europe through Kazakhstan, bringing a helpful economic stimulus to some of Kazakhstan’s poorest provinces. The project will boost Kazakhstan’s competitiveness and bring significant economic benefits both to Kazakhstan and to the broader Central Asia region. The World Bank will finance and rehabilitate a 1,062 km stretch of road between Shymkent and Aktobe/Kyzylorda Oblast border. This will be part of a US$ 7.5 billion International Transit Corridor development program of the Government of Kazakhstan to upgrade approximately 2,800 km of the CAREC corridors within Kazakhstan linking China (at Khorgos) to Russia (at Zhaisan). Charyn Canyon (kaz. Sharyn) - stretching for 154 km along the river Charyn Canyon in Kazakhstan. Canyon is located 195 km east of Almaty, near the border with China. Canyon enters the territory of the Charyn National Park, formed by 23 February 2004. Charyn Canyon - a natural monument, built of sedimentary rocks whose age is about 12 million years. Height steep mountain canyon reaches 150-300 m.
The most interesting place for tourists is the so-called Valley of locks, the length of which is about 2 km, width - 20-80 m. In the bosom of the canyon grove preserved relict species of ash surviving era of glaciation - Sogdian ash. Another similar grove is only in North America. Since 1964, Ash Grove declared a natural monument. Also of great interest is and turanga Grove - Grove Asian poplar. Landscape diversity of Charyn Canyon causes diversity of flora and fauna. There are more than 1,500 species of plants, 17 of which are listed in the Red Book of Kazakhstan and 62 species of mammals, 103 species of breeding birds, 25 species of reptiles. The Anzob Tunnel or Ushtur Tunnel is a 5,040 m long tunnel located 80 km northwest of Tajikistan's capital Dushanbe. The tunnel connects the Tajik capital to the country's second largest city, Khujand, travel to which, prior to the tunnel's construction, required travelers to cross the border into Uzbekistan in order to travel between the two cities. It is also a transit route between Dushanbe and Uzbekistan's capital Tashkent. Prior to construction of the tunnel, especially during winter, the threat of year-round avalanches led to periodic disruptions of commerce. Tunnel facilitates overcoming Hissar ridge and provides year-round road link between the northern (Sughd Province) and southern regions of Tajikistan. Earlier in the winter travel in the northern regions of Tajikistan through Anzob (height 3372 m) has been closed for 6 months. The tunnel has reduced the road between Dushanbe and Khujand by 30 km and travel time along the new route - dropped to 5 hours. The length of the tunnel more than 5 kilometers. As of May, 2014 the tunnel was still unfinished and the Iranian government and Tajik government had signed an agreement to complete the project by late March, 2015. Its construction put an end to Uzbekistan's ability to halt traffic between Tajikistan's two largest cities. It marked the beginning of other major co-operative projects such as the Sangtuda-2 power plant. The tunnel is also said to be part of a planned road which would run from Iran through Herat in western Afghanistan and Mazar-i-Sharif and Sherkhan Bandar in northern Afghanistan to Tajikistan and from there up to China. The route has been named the new Silk Road. the one can only dream of reaching after days of travelling thru hot waterless area. Soaking in the natural warm mineral water has been said to rejuvenate women's well-being in ways that improve female fertility. The springs themselves are just a simple concrete room built against the rock face where the hot water emerged. The hot water comes from a fine stalactite cave, length of which is unknown. Unlike another Pamir famous hot spring Garm Chashma where the water is full of minerals and very silty, the water in Bibi Fatima contains no chalk and is crystal clear. In the end of the 1st millennium B.C. because of the threat of military attacks from neighbors as well as for the purpose of controlling the traffic of people and cargos from Pamir to Bactria, India, Iran and back the construction of powerful fortifications began. The first of them was Yuachmun Fortress (also known as Kafyr Kala). The fortress was constructed in the 3rd century B.C. on the slope of the rock which was favorably during its construction. If seen from above the fortress has a triangular form divided into three parts. The first is the citadel with a bastion and barracks. They were walled and reinforced by towers. Two other parts are extensive platforms for conducting military actions. Each platform is surrounded with powerful walls reinforced by 36 towers with loopholes.The fortress walls are double, made from carefully processed tiled stones delivered by builders from different remote places. The outer 2 m-thick wall was made entirely from stones. The inner wall is also from stones which are only 50-60 cm thick.The entire fortress "is connected" by means of towers with embrasures cut in chessboard order and inclined downwards under a small angle so that the warriors could cover with their fire the entire valley. Some loopholes are directed both outside, and inside of the fortress which considerably increased its defensibility. The fortress amazes with its size. This powerful military structure had an exclusive significance for the local territory. Ak-Baital pass is a high mountain pass on the border of the Republic of Tajikistan (GBAO region) and Kyrgyzstan at an elevation of 4,655-meter (15,270 ft) above the sea level. The pass is a part of the Trans-Alay Range and it’s the highest road pass in the former Soviet Union. Pereval Akbaytal is crossed by M41 road, known informally and more commonly as the Pamir Highway. This section of the road is barely passable. Throughout the area, the land is typically rugged and dry. This road is sometimes referred to as "The Road from Hell”. Construction and maintenance levels vary substantially along the highway. The roadway is paved is some areas, but is mostly unpaved. The road is heavily damaged in places by erosion, earthquakes, landslides, and avalanches. The road was built during Soviet times, to connect parts of their imperium in this region. Since the breakdown and Central Asia’s independence, not much coherent maintanance has been done to the road, only in spots, where damage has been caused by flash floods or scree. Osh (Kyrgyz: Ош) is the second largest city in Kyrgyzstan, located in the Fergana Valley in the south of the country and often referred to as the "capital of the south". The city is at least 3,000 years old, and has served as the administrative center of Osh Province since 1939. The city has an ethnically mixed population of about 255,800 (in 2012), comprising Kyrgyz, Uzbeks, Russians, Tajiks, and other smaller ethnic groups. It is the most ancient city of Kyrgyzstan and is estimated to be more than 3000 years old. Osh is a lively place, with the largest and most crowded outdoor market in all of Central Asia, now named as the Great Silk Road Bazar (since it used to operate as a market during the Great Silk Road period). he city is among the oldest settlements in Central Asia. Osh was known as early as the 8th century as a center for silk production along the Silk Road. The famous trading route crossed Alay Mountains to reach Kashgar to the east. In modern times, Osh has become also the starting point of the Pamir Highway crossing the Pamir Mountains to end in Khorog, Tajikistan. Ala-Bel pass - this is one of the main "control points" on the Bishkek-Osh road. It is located at an altitude of 3175 m above sea level on the Talas Ala-Too. Pass connects Suusamyr valley and the valley Chychkan. Ascent and descent from the pass quite gentle. Pass around some mountains, heavily covered with snow in the winter, so this time the landscape resembles the white desert. The pass offers a wonderful view of the alpine meadows, which in the period of flowering herbs are full and distribute a magical flavor. Parallel to the road fast river flows Chychkan. Too-Ashu Pass - is a majestic place, located 135 km from Bishkek, on the road connecting the north and south of the capital. The height of the pass 3400 m. Road to this place truly breathtaking, and the traveler eyes open indescribable mountain scenery. Here, a strong wind blows, and the mountains are covered with ice caps all year round. But the air in the pass uniquely fresh and clean, and every person inhaling it understands that such air he never met. On the southern slope of the Too-Ashu situated ski resort, popular with skiers and snowboarders in the winter. The pass begins Susamyr.